Mori-Nu Silken Firm for entrees and desserts is low-fat, heart-healthy vegetable protein with soy isoflavones. With its creamy silken texture, this tofu is a great alternative to eggs and dairy. The airtight package needs no refrigeration until opened. Ingredients: Water, Soybeans, Isolated Soy Protein, Gluconolactone*, Calcium Chloride. *Gluconolactone is a non-dairy, gluten-free coagulant derived from non-GMO corn starch. 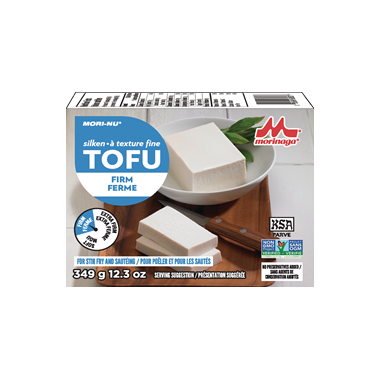 Still my favorite brand of tofu. Been buying this brand since 1989. Why I like this brand is that I don't have to press it and remove the excess water like the other kinds. I've used this to make tofu/spinach lasanga, tofu cheesecake, and even have blended it with ground beef to reduce the amount of fat when making burgers. Very true flavour and texture to fresh tofu. This tofu is perfect for making mock egg salad for sandwiches. We like it and would purchase again. Love this product, convenient tetra pack, lasts long unopened and few days opened in fridge. We used it for a snack, seasoned and fried. Yum! Love that it can be kept on the shelf. I love this tofu. It is convenient because it does not have to be refrigerated and it is very versatile. I recently used it to make vegan ranch dressing and it turned out fabulously! This is a very good tofu to make smoothies..
Nice, subtle flavour for cooking or vegan baking, but fares very nicely on its own as well. Smooth and delicious without a rubbery texture, this is my favourite tofu. Gluten-free and non-GMO is a MAJOR plus for me!